The Best Anorexia Youtube Channels from thousands of Anorexia Youtube Channels in our index using search and social metrics. We’ve carefully selected these youtubers because they are actively working to educate, inspire, and empower their audience with frequent updates and high-quality videos. About Youtuber Rachael's Road to Recovery offers videos about anorexia and how rachael is dealing with it. About Youtuber Hello and WELCOME to my channel!! My channel is dedicated to positive encouragement for those going through eating disorder recovery as well as documenting my journey throughout my own personal recovery. Join me as I take my life back and fight anorexia to grow mentally, physically, and spiritually each and every day! About Youtuber Hey! My name is Chris, I am 19 years old, and this is my journey through Anorexia Nervosa recovery. My goal through my videos has always been to spread awareness to the deadly disease of anorexia nervosa and to connect with others throughout the world who are struggling by giving them someone to relate to, as well as myself. About Youtuber Hey my name is eugenia and i make random videos that you will hopefully enjoy! I upload videos at least once a week and try to post on here as often as i can. About Youtuber I'm Holly, Mother, baker, yogi, vegan and occasional blogger. I'm recovering from anorexia nervosa one day at a time and speaking out about mental illness and my mental life. About Youtuber Hello, My name is Hanne Arts and I'm a twenty-one-year old budding writer. I'm also a blogger, a YouTuber, a mental health activists, an anorexia/ depression survivor. About Youtuber Hi! My name is Kara, aka "Recovery.Chii", and this is a channel to document my continued journey through the process of anorexia recovery. Join me for chats about mental health and eating disorders, full days of eating, and general goofiness. About Youtuber Hi I am Becky, a warrior queen battling anorexia and depression, studying to become a counsellor and hypnotherapist. I'm sharing my story in the hope that I can raise awareness and increase understanding about these complicated illnesses, but most importantly to support and help others going through the same. About Youtuber I'm 24 years old and in recovery from anorexia, purge subtype after ten years with my eating disorder. I began this channel three years ago when I was in the midst of my worst relapse yet. This channel documents the inevitable ups and downs of recovery. I am now 9 months purge free and have gained 50 pounds. About Youtuber I am an Eating Disorder Recovery coach specializing in anorexia and restrictive eating disorders. I suffered from anorexia for over 10 years. I recovered without therapy or any other professional intervention. I take a biological approach to eating disorders, and focus on getting the brain out of the anorexia response by eating without restriction and stopping all exercise or compulsive movement behaviors. I work with people with anorexia, bulimia etc. About Youtuber Welcome to ANOREXIA DOCUMENTARY TV - home of the best documentary films and documentary movies on life, health, medicine, people, anorexia and bulemia. About Youtuber This struggle is real for so many of us in so many ways. I am attempting to fight my way away from the Demon I live with, my anorexia, fittingly named Bones. Bones is horrid and I hope that as time goes on, She shrinks into insignificance, as I grow in strength. I can be so much more than what I currently am, if I inspire anyone else along the way, what a bonus! About Youtuber Hello! This is Ellie and I am a body positive mental health/eating disorder advocate and Youtuber. Recovering Anorexic and Anxiety warrior. I make vlogs on Anorexia recovery and Anorexia and am the proud owner of the 'Tea Talk' series on mental health. About Youtuber My journey to fight of my eating disorder! I have anorexia, but I want it gone. About Youtuber Illuminating & helping people RECOVER from anorexia, eating disorder, self and body image concerns. Hosted by Michelle Sparkes, health professional, author and recovery coach with lived experience of anorexia, EDNOS & binge eating. 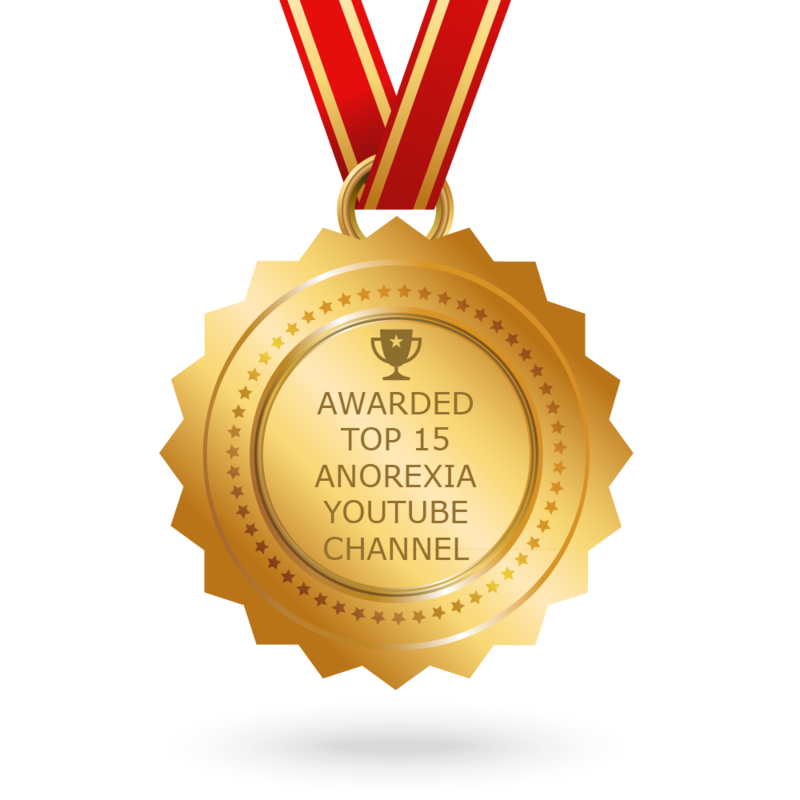 CONGRATULATIONS to every youtuber that has made this Top Anorexia Youtube Channels list! This is the most comprehensive list of best Anorexia Youtube Channels on the internet and I’m honoured to have you as part of this! I personally give you a high-five and want to thank you for your contribution to this world.